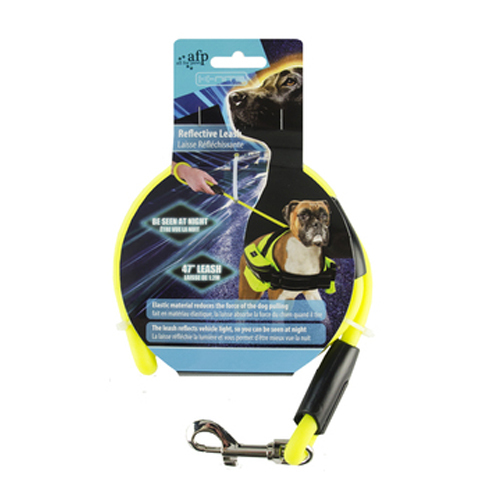 AFP K-Nite Reflective Leash is a highly noticeable dog lead that ensures high visibility at night. The AFP K-Nite Reflective Leash is a highly noticeable leash that heightens visibility at night. The leash has a reflective, neon colour that is highly visible both in the dark and from great lengths. The convenient leash is elastic and made of a noticeable, reflective, bright yellow material that reflects light from cars, making you and your dog perfectly visible in the dark. Length 120 cm and using the elastic it can stretch up to 200 cm. Have you used AFP K-Nite Reflective Leash before? Let us know what you think about this product.